I don’t know about you, but when I cook a pot of grains, I always make extra. Brown rice, quinoa, whatever—it’s a sure thing that we’ll use it up, whether it’s in a lazy lunch like a burrito bowl or a slightly more time-consuming meal like Sweet Potato and Red Lentil Soup. So when I prepped the quinoa for last week’s Nutty Quinoa-Stuffed Delicata Squash, I made extra. Instead of incorporating it into a savory dinner dish, though, I decided to try putting quinoa into muffins. And I’m really glad I did. I love the slightly nutty taste and the not-quite-crunchy texture it adds, not to mention the nutrition boost! Preheat the oven to 350˚ and prepare a dozen-muffin tin using liners or a light spray of oil. In a large mixing bowl, sift together the flour, baking powder, baking soda, salt, and spices. Stir in the wheat germ, if using. In a small bowl, whisk together the wet ingredients (not including the quinoa) and the sugar(s) until well combined. Make a well in the center of the dry ingredients and add the wet. Using a plastic spatula or a wooden spoon, stir gently to combine, but don’t over-mix. Fold in the quinoa, then add the batter to the prepared muffin tin with a spoon. Fill each well about 3/4 full. Bake for 22-25 minutes, or until a toothpick inserted in the center of a muffin comes out clean. Remove from oven and let cool for a few minutes before eating. Fair warning: If you have a major sweet tooth, you might want to add more coconut or brown sugar to these babies. Although my younger self would probably recoil in disgust at this development, I find myself less drawn to sugary-sweet baked goods these days. (With a few notable exceptions!) Especially when those baked goods might well constitute my breakfast. 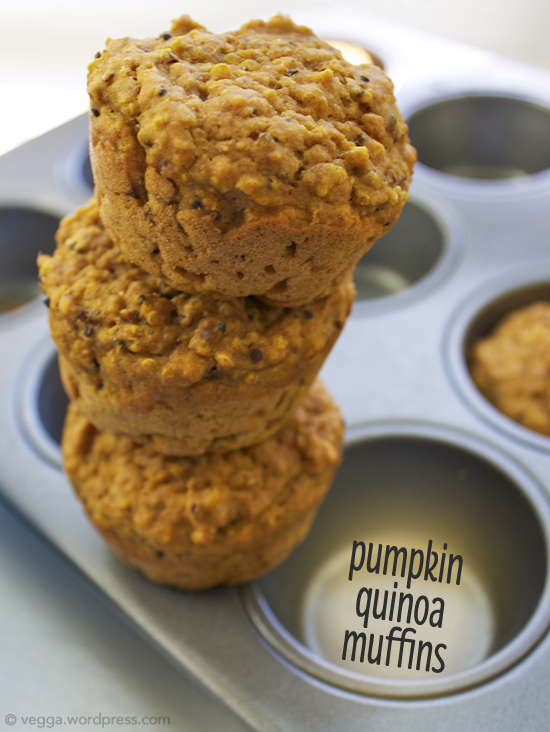 So these muffins, which are spicy and quinoa-y and not so sweet, are my perfect fall breakfast snack. I think they could only be more perfect if I’d used spelt or whole-wheat pastry flour, but alas—we have neither in the house right now, and S took the car this morning, and I was too lazy to walk over to the grocery store. Ah, Saturday. What’s your ideal Saturday breakfast? What else should I put quinoa in?! Thanks; I’ll check out your blog!